These vessels contain removable/refillable perfume atomizers to serve as scent holders. The bodies are made of Ebony and styled in a disc form with fluted edges, a burl inlay and some have a rose engine center disc of African Blackwood. 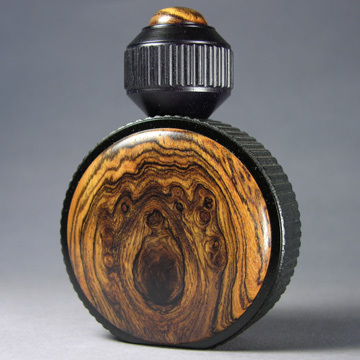 The fluted caps are made of African Blackwood, topped with a cabochon of the same wood used in the body. The removable perfume atomizer is supplied with an accordion-style syringe to use for filling from a source bottle. Dimensions for all the pieces in this series are similar: diameter of the body is about 2 3/4", thickness varies from 1 1/4" - 1 5/8", and height is about 3 3/4". The thumbnail index is arranged in succession from right to left, beginning at top right, and the captions are uniquely numbered for each piece. Click a thumbnail image below to view a larger image. There is a contact form to follow up on price and availability of any pieces of interest.